When it comes to creating a landscape garden plan, the most difficult thing is often the starting point: selecting the first type of plant. Then, from there, companion plants are selected. 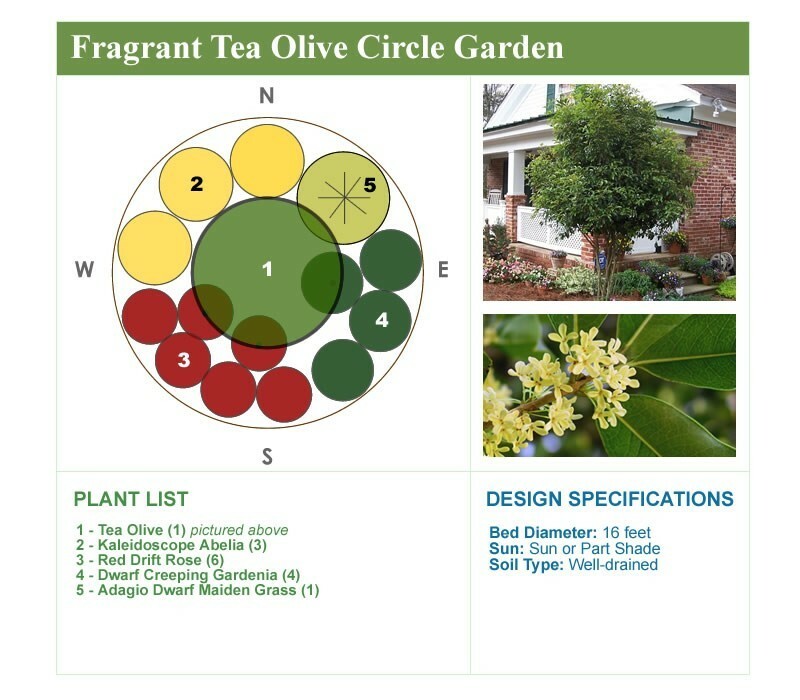 The small garden design below was designed using the Tea Olive (Osmanthus fragrans) as a the featured specimen plant. Use the design "as is" or modify it to fit your unique garden space. The Fragrant Tea Olive, Osmanthus fragrans, also known as the Sweet Olive, is a large evergreen shrub or small tree that produces an abundance of powerfully fragrant flowers in fall, spordaically through winter, and earl to mid-spring. The flowers are tiny but boy do they pack a punch! All it takes is one Tea Olive to fill the front or backyard with a heavenly scent of perfume. IMPORTANT: Always be sure to check USDA Plant Hardiness Zones for each plant to make sure it will grow in your zone. If a plant will not grow in your zone ask your local nursery and garden center professional to recommend a comparable plant.